As a follow-up to the Sneak Peak of the Data Server post, I wanted to provide more details on the centralized data management aspects of Tableau Server 7.0. With Tableau Server 7.0, you can securely share your workbooks, share your data connections and share your data extracts. Tableau Data Extracts and database connections can be managed centrally within Tableau Server and shared across workbooks. The published data source includes all calculations, user filters, sets and groups created in Tableau, so both definitions and data can be easily shared. The extracts are stored on the server rather than downloaded/uploaded for each workbook. In this blog, I will walk you through the process of defining data sources, publishing, managing and securing your data sources. Tableau’s Data Server allows you to centrally manage metadata. Changes to a master data source can be automatically propagated to workbooks that use the data source. At any stage of creating a data source, the metadata can be published to the Tableau Server reducing complexity and administrative overhead. A Tableau Data Source consists of the data connection information and data model. The data source stores information about how to access the data and what data to make available to Tableau. This data source includes attributes for the database, the tables, views and columns to use, in addition to any joins or custom SQL required to access the data. The data model contains dimensions and measure fields including additional metadata such as data types, roles, defaults, aliases and more. Additionally, it includes calculations, sets, groups, hierarchies and parameters. The Tableau Data Source is defined in Tableau Desktop. There isn’t a separate modeling or development environment. A user with knowledge of the data can easily create a data source. To create a data source, you simply connect to the data source and start enriching the data model by renaming columns, creating hierarchies, adding calculations, sets, groups, bins, and parameters. All of these ‘modifications’ become part of the metadata contained in the data source that will then be shared with other users. In the past, the data source metadata was part of the workbook. With Tableau Server 7.0, you can now separate two and have multiple workbooks share the same metadata stored on the server. When connecting to data, Tableau provides the option to connect ‘Live’ to the database or extract the data into Tableau’s fast data engine. This flexible approach has many advantages by enabling you to leverage existing database investments or accelerating slower databases by loading the data into memory. You can always choose to start with a live connection and then decide to create a Data Extract. Or vice versa. The Tableau Data Server supports both extracts as well as ‘Live’ database connections. The data server provides centralized management of your data extracts reducing extract proliferation, data duplication and storage needs. You can also schedule extracts to be refreshed ensuring that everyone is working off of the same data. Tableau Server can also be used as a database connection proxy by centrally installing and configuring database drivers. Tableau Desktop users then connect through Tableau Server to access the back-end database server reducing the need to deploy, configure, and update database drivers on each client. Publishing a data source is very similar to publishing a workbook to Tableau Server. 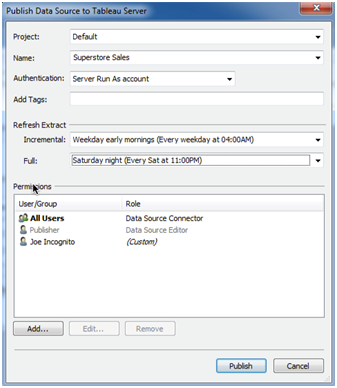 A user with the appropriate permissions can publish the data source including all of its metadata to Tableau Server. If you are using Extracts, you can define the refresh schedule for incremental and full refreshes. The refresh will occur on Tableau Server and the updated data will automatically be available to all workbooks that use this data source. The refresh schedule and priority can always be modified on the server. You can also define permissions on the data source to specify which users are allowed to connect, modify, or download the data source. This ensures that only authorized users can access this data source. Administrators can manage data sources centrally in Tableau Server. A new data source menu is available which lists all of the data sources available on the Server. The Administrator can modify permissions, delete data sources and manage the scheduled tasks assigned to a data source. The Administrator can also go to the maintenance reports to get a better understanding of disk space usage across data sources and workbooks; monitor background tasks and ensure that the data refresh schedules executed successfully. An important of any data management solution is to ensure the right levels of permissions are applied to data. There are a number of new permissions available with Tableau Server Data Sources including determining who can View, Write, Connect, Delete, Download and Set permissions. These permissions can be applied at an individual user level or for an entire group of users. Permissions can also be inherited from a Tableau Project to streamline permissions across multiple data sources and workbooks. Once connected to a Tableau Server data source, workbook authors are also able to add User Filters to any workbook to ensure more fine-grained data level permissions. To change a Tableau Data Source you simply need to republish the data source to Tableau Server and overwrite the previous version. All workbooks that use this data source will automatically inherit the changes made. For example, when adding new tables and new columns, no user intervention is required. The fields are automatically available for analysis when the data source is opened or refreshed. When deleting fields, the user will have the opportunity to replace all instances of the original column with a new one. The Data Server is a component of Tableau Server 7.0. There are no additional components or services to deploy. People with database expertise can establish, define and maintain data sources across the deployment. Authors and power users can extend the data model as needed to satisfy their requirements. End users have the flexibility to use the fields in a variety of roles to answer their specific questions. Tableau Server will help organizations scale their BI deployment to more users while still providing the flexibility and agility required to support their growing business needs. In an upcoming post, I will discuss the author/user perspective when working with Tableau Server data sources. just a comment...One cant do an extraction from a connection to the Analysis server. quite frustrating when you need only a few dimensions from the actual source but now have to connect to entire base. Working with Large amounts of data this becomes very cumbersome....any work around to this? Hi Amoryn - yes, this is a limitation when working with cubes since cubes are already pre-structured and pre-aggregated. You could always try to connect to the underlying database directly from Tableau and recreate the dimensions/measures/calc directly within Tableau instead. Shouldn't be too hard if you have a star schema structure for your database. If I choose to import all data rather than connect live, and have gone through the process of creating all my worksheets and dashboards, and then decided that a live connection may be more beneficial, is it possible to now change this so that I connect live to the data without losing all my work? Or should I save all my worksheets as bookmarks and create a new Tableau file, connect live and then open all my bookmarked worksheets in this new file? Hi Guest - the simple way to handle this is to republish the data connection as a live connection instead. No changes to your worksheets or bookmarks will be required. they'll automatically connect live after publish. I'm sorry, I have not published to the Tableau Server, I am currently using Tableau 7.0 Desktop. How would I go about doing this in Desktop?